“I declare this Saturday ‘Francie Day’ in River Heights!” Mayor Strong told the crowd in front of the River Heights Theater. 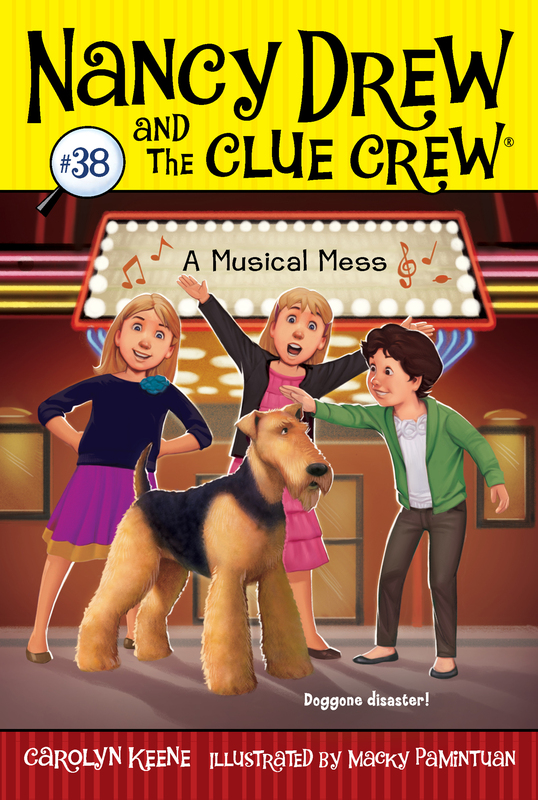 Eight-year-old Nancy Drew cheered along with Bess Marvin and George Fayne. The girls and the people of River Heights had good reason to celebrate. The national tour of a real live Broadway musical called Francie was in town for two whole weeks! “This show is practically famous!” Nancy said excitedly. She knew the show was about a farm girl who travels all over the country to find the owner of a lost dog named Sammy. “I hope you taught yourself how to sing, too,” George joked. Nancy giggled as Bess rolled her eyes. Her two best friends are cousins. They are always teasing each other, probably because they are so different. Bess has blond hair, blue eyes, and a room full of fashion-forward clothes. George, with her dark hair and eyes, likes clothes too—as long as they have tons of pockets for electronic games and computer parts! “Thanks to my mom,” George reminded them proudly. Mrs. Fayne ran her own catering company. Later she would cater a big after-show party for the cast and crew of Francie to celebrate opening night. Nancy smiled as a tall woman with curly black hair stepped forward. Seeing the director was exciting, but the person Nancy really wanted to meet was Kira Swain, the ten-year-old actress who played Francie. Nancy gasped as the stage door began to open. Who was coming out next? Was it Kira? Sammy? “It’s just the Star Squad,” George, a bit disappointed, said as a bunch of kids filed out the door. The Star Squad was a summer acting camp in River Heights. This summer they had been asked to play Francie’s farm friends in the show. Nancy recognized some friends from school, like Nadine Nardo, the class actress. There was also Marcy Rubin and her little sister, Cassidy. But who was the kid in the big heavy cow mask? “Did someone just say ‘Boo’?” Nancy asked. “Maybe the cow said ‘Moo,’ ” Bess suggested. She got her answer as the girls turned around. Standing behind them was a group of people wearing costumes. “Boooooooo!” a tall man dressed as a pirate shouted again. The music was too loud for anyone to hear—anyone but Nancy, Bess, and George! “It’s not nice to boo,” Nancy told the man. “Who are you guys, anyway?” George asked. The other actors with him took sweeping bows. “Are you here to see Francie?” Bess asked. Nancy saw that some of the actors were holding up signs that read FRANCIE, GO BACK TO BROADWAY! Winslow narrowed his eyes. “Not if I can help it,” he muttered. But then he threw back his head and began to sneeze. The girls stepped back as Winslow sneezed over and over again. Nancy, Bess, and George watched as the Croaking Frog Players quickly left. “Who ever heard of a sneezing frog?” someone with a familiar voice asked. The girls turned to see their friend from school, Shelby Metcalf. But she wasn’t alone. Shelby and a college-age girl were grasping the leashes of six dogs. “Are all those dogs yours, Shelby?” Nancy gasped. “Neat!” Nancy said. She noticed that Shelby was wearing a yellow Rollover Rescue T-shirt. So was the girl with her. The dogs wore yellow scarves around their necks. Each scarf had the words ADOPT ME printed in black letters. “I read online that Sammy was adopted from a shelter,” George said. “You mean Sammy, the star dog?” Shelby asked. “I didn’t know that,” Nancy admitted. The crowd suddenly went wild as Kira Swain burst from the stage door. She was wearing Francie’s famous blond wig and blue dress. Bess cheered so loudly, Nancy had to cover her ears—especially as the sandy-colored Airedale terrier ran to Kira’s side. Holding Sammy’s leash was a short man with dark hair. A few of Shelby’s shelter dogs began to bark. Carlos frowned as his eyes searched the audience. Nancy said a quick good-bye to Shelby, and then she, Bess, and George squeezed through the crowd toward Kira and Sammy. As the girls got closer Nancy noticed a white mark on Sammy’s front leg. It was shaped like a star! A star for a star! Nancy thought. Mayor Strong handed Kira a microphone. She smiled as she began singing the hit song from the show: “I Never Give Up.” Sammy got into the act too, jumping up and licking her face at just the right moments. For the big finish, Kira sang the last words of the song, then kneeled down next to Sammy, who howled along with her last note before licking her again. When the song was over, Kira traded her microphone for a pen. Carlos held up a piece of paper. On it was a black print of Sammy’s paw. “I want one of those!” Bess said. The earsplitting scream came from Kira, who was shrieking as ink from her pen gushed up in her face!